Many immigrants who entered countries such as the United States sought assistance upon their immigration, e.g. food, housing, etc. Aid societies, such as the Hebrew Immigrant Aid Society, founded by Russian Jewish immigrants in New York City in 1881, often had a representative stationed at the major ports of entry, waiting to help each and every immigrant they could. The founding of HIAS was in response to the huge wave of immigration that occurred following the assassination of the Russian Czar Alexander II in 1881 and the subsequent pogroms. Many Jews were forced to flee Russia and immigrate to the United States, the majority entering via the port of New York. There, HIAS would provide food and shelter to the new immigrant, and try to find them a job. In 1911, HIAS even provided a kosher kitchen at Ellis Island and fed more than half a million meals between 1925 and 1952. What type of information does this form provide? 17. Here before in U.S.? The Hebrew Immigrant Aid Society was created to provide meals, transportation and jobs for those who immigrated through Ellis Island. A shelter was also established that was used to house immigrants without families, and was located on the Lower East Side. In 1889, this shelter became known as the Hebrew Sheltering House Association. Here they housed these immigrants and created a soup kitchen and gave clothes to any Jewish immigrant who needed such clothing. 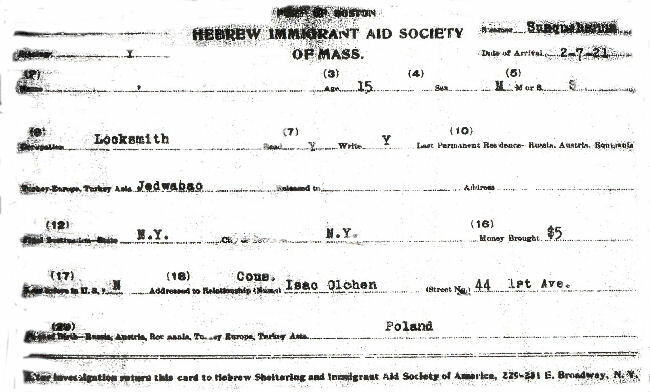 In 1909, the Hebrew Immigrant Aid Society merged with the Hebrew Sheltering House Association and became known as HIAS. 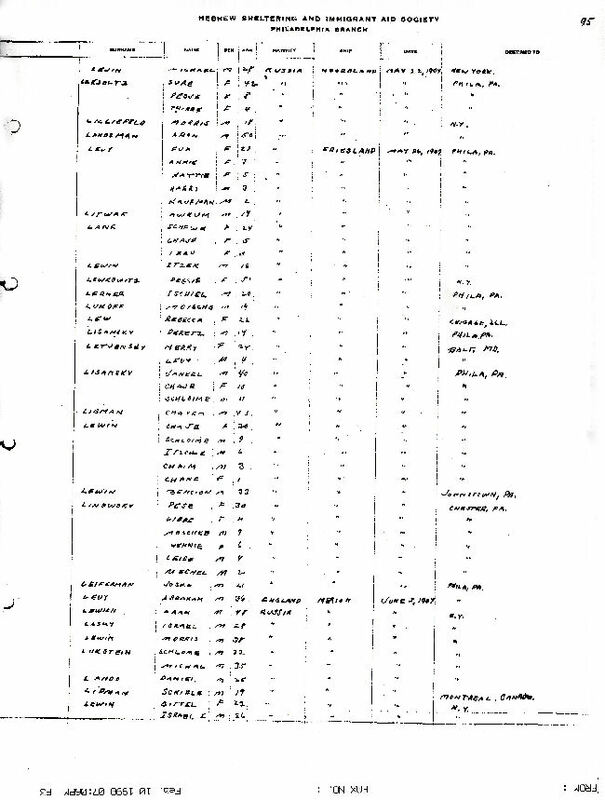 Perhaps the list shown on the left was made of all the immigrants that registered at HIAS upon their arrival in the United States, here in the port of Philadelphia, Pennsylvania.